Hexavalent uranium, or U(VI), is an environmental contaminant of concern at several U.S. Department of Energy (DOE) sites. Microbes, such as those in the genus Shewanella, can reduce the highly mobile U(VI) complex to poorly soluble uraninite (U(IV)O2), thus limiting its migration in groundwater. However, there is little information about the electron transport pathways used in biogenic U(VI) reduction, and even less is known how extracellular U(IV)O2 forms. A team of researchers from Pacific Northwest National Laboratory (PNNL), Argonne National Laboratory (ANL), and the University of Wisconsin, Milwaukee investigated the role of Shewanella oneidensis MR-1 in uranium reduction. They showed that outer membrane c-type cytochromes—proteins involved in electron transport or reductive/oxidative reactions—play a crucial role in biogenic UO2 nanoparticle formation and extracellular localization. Their results appear in the August issue of the journal Public Library of Science Biology (PLoS). This research project is the first study to directly localize the outer membrane-associated cytochromes with extracellular polymeric substance (EPS), as a complex structure, which contains UO2 nanoparticles. While the exact mechanisms leading to the formation of UO2-EPS matrix are yet to be determined, the UO2 association with EPS clearly affects the nature and distribution of reduced uranium. 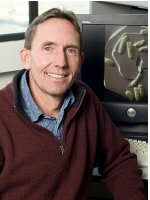 The researchers used a novel combination of methods including synchrotron-based X-ray fluorescence microscopy at ANL's Advanced Photon Source and high-resolution electron microscopy analyses at the Environmental Molecular Sciences Laboratory (EMSL) located at PNNL to characterize UO2-cytochrome interaction. In the environment, such association of UO2 nanoparticles with biopolymers may exert a strong influence on subsequent behavior in the environment including susceptibility to oxidation by O2 or transport in soils and sediments. 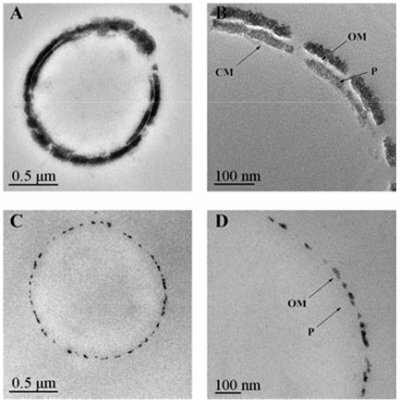 Their work is a significant advance in understanding radionuclide reduction mechanisms and the complex nature of the EPS associated with extracellular UO2 nanoparticles. Co-authors of the paper are Matthew Marshall, Alex Beliaev, Alice Dohnalkova, David Kennedy, Liang Shi, Zheming Wang, Jeff McLean, Bree Reed, Dave Culley, Vanessa Bailey, Cody Simonson, Margie Romine, John Zachara, and Jim Fredrickson, all PNNL; Max Boyanov, Barry Lai, and Ken Kemner, ANL; and Daad Saffarini, University of Wisconsin, Milwaukee. The work is a part of a concentrated effort to characterize the biogeochemical processes involved in energy metabolism of metal and radionuclide contamination. It was supported by DOE's Office of Biological and Environmental Research's (BER's) Environmental Remediation Science and Genomics: GTL programs. Part of the work was performed as part of a Scientific Grand Challenge project at the W.R. Wiley Environmental Molecular Sciences Laboratory, a national scientific user facility sponsored by BER and located at PNNL. Work at the Advanced Photon Source is supported by the DOE Office of Science, Office of Basic Energy Sciences. General user support for the XRF microprobe work was also provided by the DOE's Environmental Remediation Sciences Division. Marshall MJ, AS Beliaev, AC Dohnalkova, DW Kennedy, L Shi, Z Wang, MI Boyanov, B Lai, KM Kemner, JS McLean, SB Reed, DE Culley, VL Bailey, CJ Simonson, DA Saffarini, MF Romine, JM Zachara, and JK Fredrickson. 2006. "c-type cytochrome-dependent formation of U(IV) nanoparticles by Shewanella oneidensis." PLoS Biology 4(8):1324-1333.